This cabin is amazing - it has everything you can ask for - high-end finishing touches throughout, big screens, pool/shuffleboard/video game machine, hot tub, AMAZING vistas, comfortable beds and couches, huge bathrooms, and so much open room to wonder... I've already shared it with my family and church friends (for retreats). Can't wait to go back!! What a awesome cabin this is! Such beautiful views and accommodations like this are not easily found. Fit for the entire family or a group of friends! 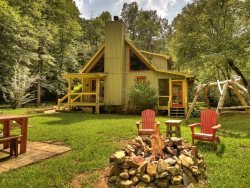 This is everything a Cabin get away should be and more! This cabin is so much more than a cabin. More of a luxury retreat-lodge. Plenty of room for a big group. The leather sectional comfortably seats something like 12 people. Plenty of bathrooms, bedding, pillows, towels, dishes etc. Nice and clean. Beds are super comfy. The views are stunning. Even has an outdoor fireplace. 5 stars all around! The team at southerncomfort cabin rentals were very inviting and helpful, they made the experience that much more enjoyable. Moon kiss was an awesome cabin. The views were breath taking. The amenities of the cabin were great. Would definitely recommend this cabin to anyone. Staff is extremely friendly and helped in every way possible. Absolutely loved the property. Quiet. Nice. And extremely clean. I only had dealings on the phone and one gentleman at check in. Everyone was polite, knowledgeable and friendly. Property was awesome. Furnishings were top notch as were all the amenities in this cabin. I picked this cabin out by myself and upon arrival my wife and the other couple we were with were very pleased. We will definitely use SouthernComfortCabins again. The property, the people, everything was wonderful about our vacation. We decided to make it an annual event. The house was awesome but very comfortable. The indoor, woodburning fireplace was just what we wanted. Eagle-sky was a beautiful cabin and exceeded our expectations. We enjoyed a nice relaxation vacation and cannot wait to return. Fabulous!! Loved the cabin & loved the area. Everything was perfect!! Always replied to inquiries in a timely and professional manner. Very courteous. This property was absolutely perfect. Very user friendly for families. Location was breath taking. Plenty of comfortable room for family to spread out. Was very happy with all of the kitchen amenities. If we do a Blue Ridge trip again we will pick Evening Shade again. Big Bang for the buck. Very clean! Everyone I spoke with was fantastic and helpful! We had a wonderful relaxing time. The cabin was very spacious. The fire place and hot tub were great to use over the weekend! Everyone was amazing with the rental experience all questions answered and everything was ready for us when we got there. This was my first time at this property. The house was beyond what we imagined. The house is breathtaking, everything that you could need is there at the house. The location and views will make you never want to leave. This house will be a must every year for our trip. Plus recommended to all friends who are looking for the perfect getaway with everything you need.